will map the data in Z linearly from -1 to +1, so Z=0 will give a color at the center of the colormap RdBu_r (white in this case). 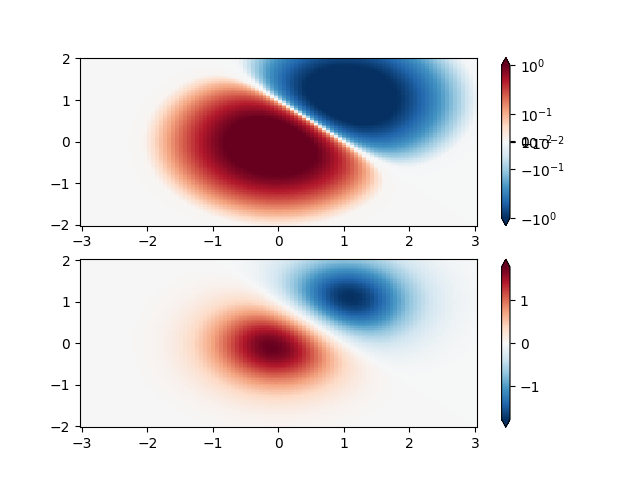 Matplotlib does this mapping in two steps, with a normalization from [0,1] occurring first, and then mapping onto the indices in the colormap. 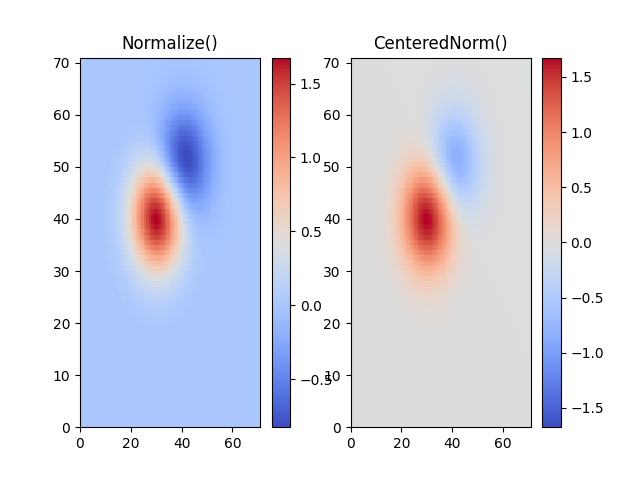 Normalizations are classes defined in the matplotlib.colors() module. 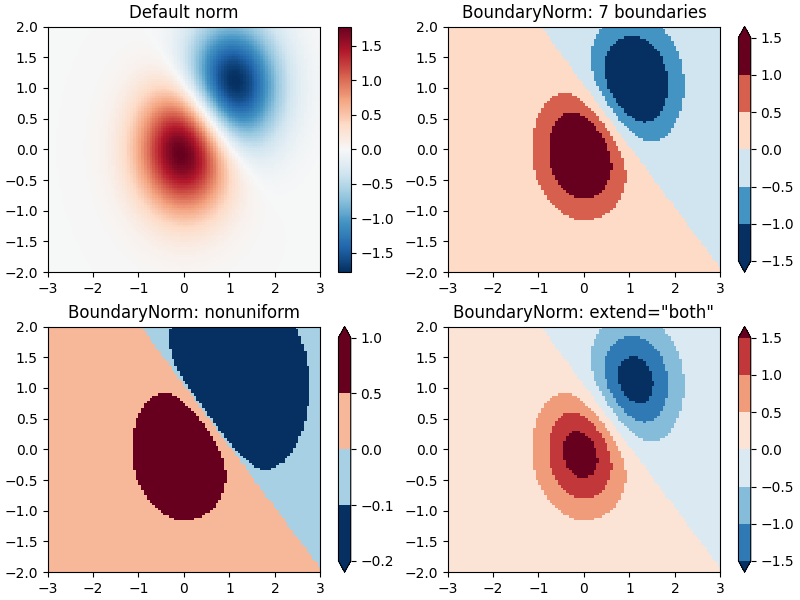 The default, linear normalization is matplotlib.colors.Normalize(). However, there are sometimes cases where it is useful to map data to colormaps in a non-linear fashion. Similarly, it sometimes happens that there is data that is positive and negative, but we would still like a logarithmic scaling applied to both. 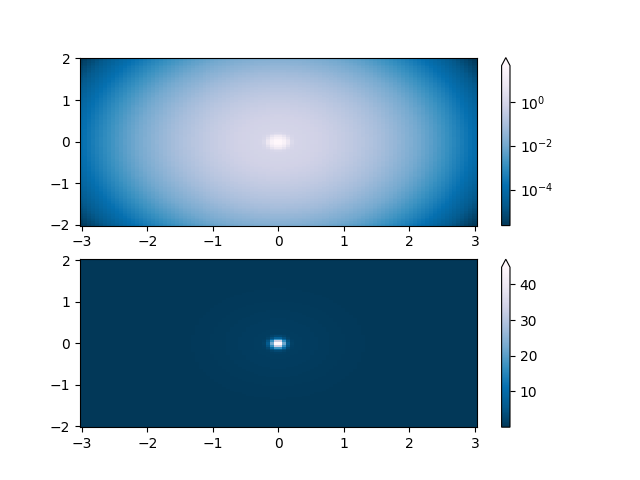 In this case, the negative numbers are also scaled logarithmically, and mapped to smaller numbers; e.g., if vmin=-vmax, then they the negative numbers are mapped from 0 to 0.5 and the positive from 0.5 to 1. Since the logarithm of values close to zero tends toward infinity, a small range around zero needs to be mapped linearly. The parameter linthresh allows the user to specify the size of this range (-linthresh, linthresh). The size of this range in the colormap is set by linscale. When linscale == 1.0 (the default), the space used for the positive and negative halves of the linear range will be equal to one decade in the logarithmic range. There should probably be a good reason for plotting the data using this type of transformation. Technical viewers are used to linear and logarithmic axes and data transformations. Power laws are less common, and viewers should explicitly be made aware that they have been used. Note unlike the other norms, this norm returns values from 0 to ncolors-1. 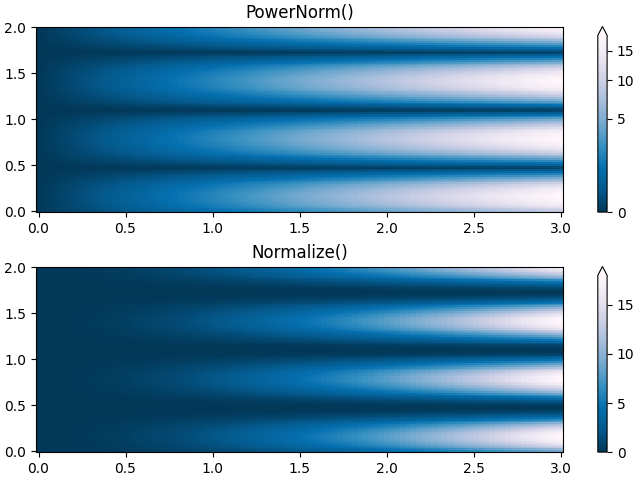 Sometimes we want to have a different colormap on either side of a conceptual center point, and we want those two colormaps to have different linear scales. 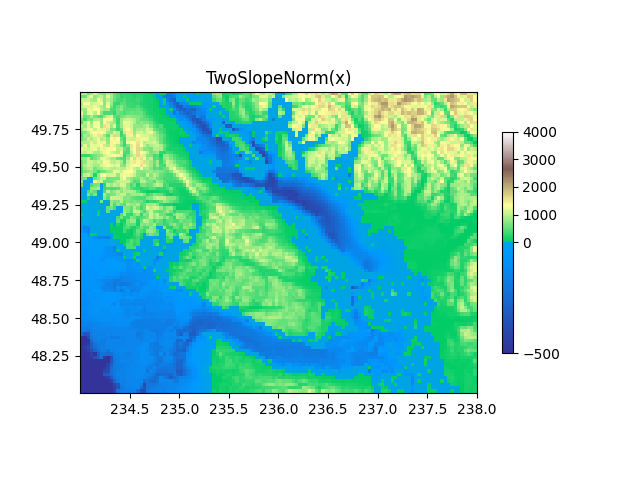 An example is a topographic map where the land and ocean have a center at zero, but land typically has a greater elevation range than the water has depth range, and they are often represented by a different colormap. # longitude depends on latitude. The DivergingNorm described above makes a useful example for defining your own norm.